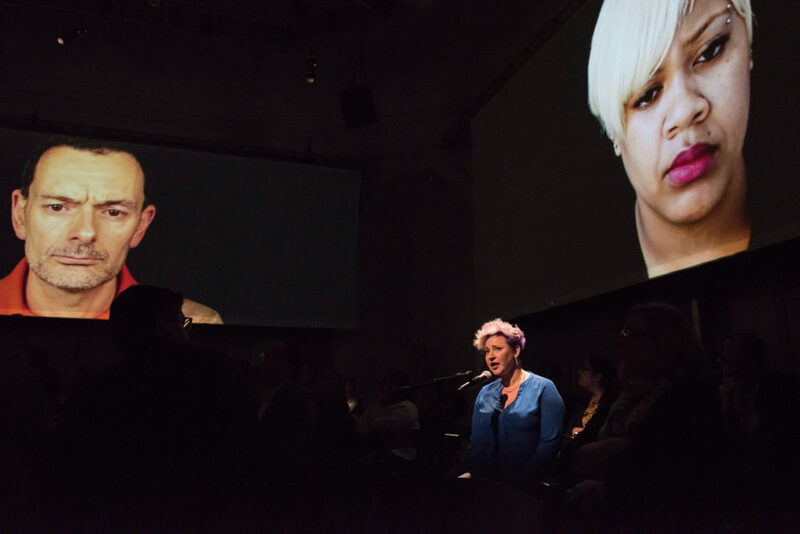 SF Opera Lab recently put on Ted Hearne’s work The Source, an oratorio/album/“patchwork of songs” drawn from primary source documents around and related to Chelsea Manning and the documents she leaked in 2010. Source texts include actual incident reports from the Iraq and Afghanistan wars and online conversations between Manning and Adrian Lamo, a former hacker who eventually turned Manning in. The work is scored for four voices, string trio, rock trio (guitar, bass, drums), and keyboard/director, and makes heavy use of sampling and custom auto-tune on the singers. I had a chance to speak with Hearne and see the work, which was in the Taube Atrium on the fourth floor of the SF War Memorial Veterans Building, just a stone’s throw north of the Opera House. The audience was arranged in two groups facing each other, filling up the entire floor. On each wall was a projection screen, behind one of which the band was placed. The four singers were seated, spread out among the audience, following the conductor from tiny screens connected to their microphone stands. 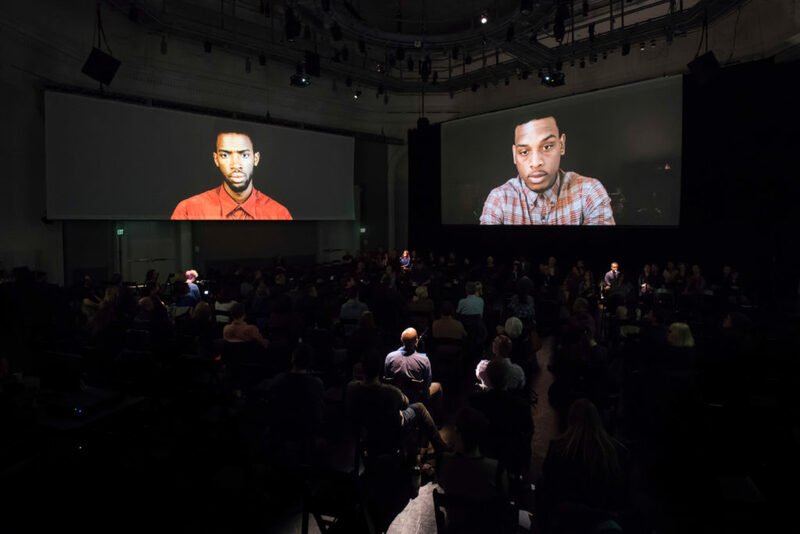 The projections consisted almost entirely of the faces of a diverse group of Americans (admittedly mostly New Yorkers), who were watching or reading something with mostly blank or engrossed faces, and only a few punctuating moments of emotion. The programs had the date 5.17.17 stamped as the only thing on the cover, the date of Ms. Manning’s forthcoming release. SF Opera Lab presents “The Source” composed by Ted Hearne, libretto by Mark Doten, and directed by Daniel Fish, at Opera Lab on Thursday night, February 23, 2017. Photo by Stefan Cohen. Joseph M. Colombo: What is new about this performance of The Source with SF Opera Lab? Ted Hearne: The space is different, this is not a black box. It’s cool to have it in this public building [Taube Atrium Theater at the Veterans Building], kind of a government vibe. It’s interesting, it seems more like a public space. You can really see the walls, there’s no true black out that’s possible. So it makes it feel less like a theater piece and more like something that we are all experiencing together in a community space. But it is still a theater piece, of course. There’s that, and there are a lot of other little differences. We have new string players here, they come from the SF Opera, so they’re bringing a different feel to it for sure. But it’s the same piece, and it’s interesting to see the same piece played in different cities. JMC: A lot has happened in the past two years. How do you feel this piece has changed, or its place in the world has changed? TH: I have actually been thinking about that. The content is totally the same. You know, we’re still involved in a war in Afghanistan (isn’t that amazing? ), and we’re still living with the consequences of the war in Iraq. We have new knowledge of the things that have transpired in the last three years, but essentially the text of this piece is public record. And it’s something that relates to our identity as Americans. Three years doesn’t do much to change that. If you hear a piece that’s fifty years old or a hundred years old, then I think you can start really talking about applying its meaning or reception to a completely different series of events or a completely different historical circumstance. But at this point I feel like it’s pretty much the same, and it’s just interesting to think about what Julian Assange has done in the last three years and what Chelsea Manning has written in the past three years, and of course now that her sentence has been commuted. It’s interesting to think about this stuff, but I don’t think it changes the content of the work that much. JMC: Has Ms. Manning heard this? Do you know what she thinks of it? TH: I have been told that she has heard it, over the phone. We would love to put a performance together for her when she’s released. JMC: What is your writing process like for a piece like this? TH: Always words first. When I write a piece from text, the text really drives it. Until I have text that I can add something to, I won’t be able to start writing. JMC: Can you speak in some technical detail about what you’re doing with the auto-tune? Composer Ted Hearne. Photo by Nathan Lee Bush. TH: I developed the auto-tune with Philip White. Philip is a brilliant musician, composer, and a brilliant mind with electronic music. We have a band, R We Who R We, and when we were working on our first album we were playing a lot with auto-tune, and playing with a pretty simple Max patch—essentially an auto-tune type of thing—and messing with the wet/dry mix so that you had different sound combinations of what my real voice sounds like versus what the processed voice sounds like. And then limiting what pitches would come through. We were playing with that and the sound that we were getting was particularly beautiful and glitchy. The technique is really about two voices at once. JMC: Do you always work in Max/MSP or do you use other programs as well? TH: Philip has taught me a little bit of Max, I’m still not very good at it. We use Max for a lot of live stuff. When I compose I use Ableton/Live a lot. Use to use Logic. JMC: How do you balance doing a multimedia project like this? The autotune effects versus the text versus the visual images, how do you balance all of that mentally when you’re working on the piece? TH: Well, it was just a beautiful melange of stuff that took a really long time to sift through. The auto-tune singing I used to set the text of the Iraq War Logs and the Afghan War Diary. Those are the specific Department of Defense documents. I started singing some of that text through our auto-tune patch. The sound of it became very evocative, for me started to symbolize the distance between me and these people that were being depicted in some of these logs that have such a different life than me. In terms of balancing it with everything else? There was a lot in the stew. We worked with Daniel Fish the director, he was talking about ideas for the placement of the audience and the video, stuff like that. That became a part of the concept of the piece about halfway through when I was writing it, so I started integrating that into my thought process too. JMC: Can you speak a little bit about how Mark made the choices about what to include or not include in the libretto, and then how you reacted to that on a large structural level? TH: Mark and I did it very much together. He had some really incredible ideas about ways to filter through the Logs. So he would do a lot of sifting, then send me chunks of text, send me ideas, and I would read things. Then we’d have conversations about what was grabbing both of us. The decision about what to set to music came down to me, really, because of what I felt would be musical. JMC: So you felt that there were chunks of text that spoke to you, musically? That you got a good mental image, for lack of a better word? TH: Absolutely. And you start to see connections between different texts. Those are the things that help us piece it together. JMC: What do you think makes a musical work dramatically successful? TH: I have to say that I go on intuition a lot with that type of thing. I think about drama, or linear expectation, with any music I write, whether or not it’s staged. I don’t typically use linear narrative in terms of storytelling or anything. I don’t know very much about that, I don’t think about it too much. I sort of think about it as what are the elements that contrast with each other nicely, how can I use adjacency and juxtaposition of musical ideas in a way that sparks interest and can hold together over a long period of time. But in terms of anything dramatic, I don’t think about it too much. JMC: Speaking of texts in the public domain, you do use some recordings that may have some forms of copyright on them. How do you view copyright issues and musical appropriation? TH: I think the usage of copyrighted recordings in this piece is fair, fair use. Fair use doctrine is something that’s pretty vague, and is sort of toothless in recent court decisions. But it is somewhat clear. And I would say that three out of the four stipulations of what constitutes fair use are present in this piece. And of course the samples that we use in this piece are very short, are used in a completely transformative way, and could never been seen as financially detrimental to the original source. I think that the piece in many ways is about recombination and appropriation. It points to the ways that we embrace musical context and genre in general. These are conversations that I’m interested in having. So, if anyone wants to have them, we can have them. But in terms of this piece I’d say the usage is fair. 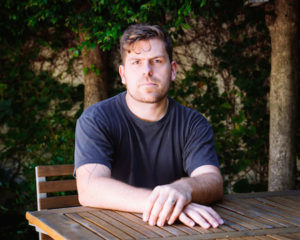 Joseph M. Colombo is a New England-born, San Francisco-based post-classical composer and noise maker. He has written music for orchestras, chamber ensembles, electronics, stage, film, installations, and everything in between. His work has a vibrant energy, often exhibiting a strong rhythmic drive, and has been referred to as “a powerful auditory experience” and “a wash of sound and color” (I Care If You Listen). Visit josephmcolombo.com for more info.